CHIANG RAI, Thailand — Although Thailand’s new decree on foreign labor has scared many migrant workers back to their homeland, other Myanmar people with legal documentation allowing them to live and work in Thailand have apparently welcomed the new regulations…by posting photos of themselves modeling the required documents. 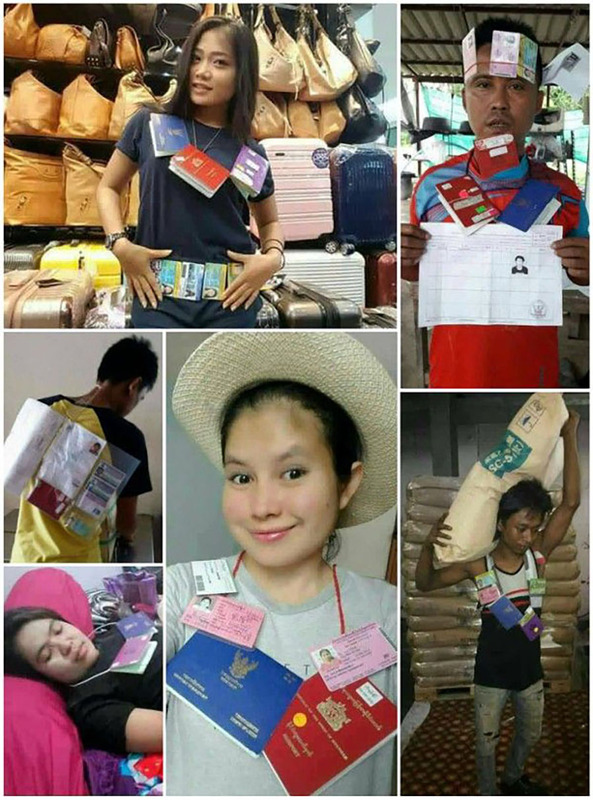 Several people from Tachileik, the border town in Shan State across the river from Mae Sai in Thailand’s Chiang Rai province, shared their pictures on Facebook—perhaps starting a new fashion trend of “document necklaces”—stringing together their passports, ID cards and employment documents. One posted a video of herself flaunting the documents in a dance routine. Pakaimas Vierra, vice chairperson of the Chiang Rai Chamber of Commerce, said on Tuesday that few Myanmar workers had been obliged to return to their homeland through Mae Sai because Chiang Rai immigration police had effectively enforced regulations in the past, and there were few factories in the province. Unlike provinces on the western border such as Tak, she added, there were no large cities on Myanmar soil across the border from Chiang Rai. Only 44 Myanmar people left Thailand through Chiang Rai’s Mae Sai border crossing on Saturday, and 14 others did so on Sunday. Labor authorities earlier said about 30,000 migrant workers had left Thailand through permanent border checkpoints nationwide since June 23, when the new executive decree on foreign workers took effect, with a fine of up to 800,000 baht (USD$23,500) per case of illegal employment. As the decree caused employers to lay off many illegal migrant workers, and workers themselves were seriously worried about penalties including imprisonment of up to five years, the National Council for Peace and Order decided on Tuesday to delay the enforcement of the decree until the end of this year.